Deer Valley Luxury Townhome - "Serena"
This beautifully furnished home sleeps six guests in three bedrooms, all with private bathrooms. There is one Queen in one bedroom, and King beds in the other two bedrooms. Open plan kitchen, dining room and living room make this an ideal area for after ski family gatherings. The living room features a lovely leather sofa and arm chairs, a 36" television/VCR, stereo, and a gas fireplace to gaze into after a long day of skiing that Utah powder. This wonderful home is situated right between lower Deer Valley and Old Town, Park City. A short walk down a flight of stairs will take you to the shuttle stop for Deer Valley, about ten blocks away. A five minute walk or free shuttle will take you to Main Street, Park City, shop, dine, go clubbing, have a great time! My husband, my three boys and I loved staying at this comfortable property. Bedrooms have such nice high ceilings, great bathrooms and comfy beds. We loved watching TV at the end of the day in front of the fireplace.... such an easy walk to Main Street, and easy to catch the Free Bus to PCMR and Deer Valley. Susan (property manager) so easy to work with... we will be back again! So happy you enjoyed your stay in Park City, thank you! Very nice place and walkable to town for restaurants. Property is in a good location close to town and slopes and the luxury condo has all a family needs in the kitchen plus a gas fireplace and a hot tub for apres ski. The property manager is attentive and available. The townhome is really excellent. Location is roughly a 10min walk to main street which is so nice for dinners. The home is up a small hill so while the shuttle stops were very close in distance, going up/down the hill with ski gear can be challenging. The home is equipped with everything you need. I always felt like it was one step ahead of us and clearly feels like a home, not a permanent rental. Susan was extremely accommodating and very easy to get ahold of during the weekend. A+ place!! Lovely And charming house in excellent location. We enjoyed ours weekend of skiing in dining very much. Couldn’t ask for a better location. 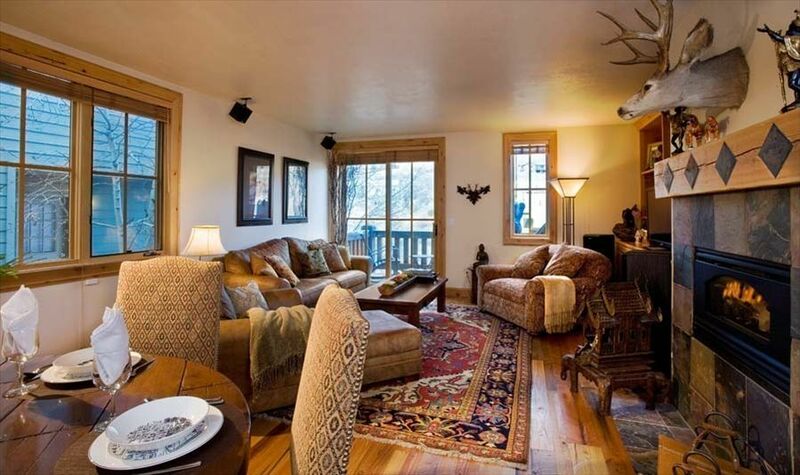 Walking distance to both Main Street, Park city chair lifts and deer Valley resort. The location of this home is a short five minute walk to Downtown Park City which makes it easy to get to dinner or shopping without any transportation. We used the free shuttle bus at the base of the street to get to either resort, Park City or Deer Valley and we found it very efficient. The house was lovely and well equipped and had a hot tub which is important to us. Susan, the property manager, was very helpful too. The BEST VRBO home ever! We've stayed at many VRBO homes over the last 10 years or so in different parts of the country, and I have to say this one was absolutely one of the best! The owners thought of everything renters need for a super comfortable, worry-free stay. It was close to everything but private as well. My husband and I and our two teenage daughters had such a great time - we will be staying here again!